The Peggy Rockefeller Rose Garden, view from the tram road. In June my partner Jeffrey and I took a trip to New York. The first day we were there we endured a plane trip from Atlanta to Pittsburg, and a train from Pittsburg to Manhattan. From the train station we immediately set off for a trek around the city. New York was surprisingly hot and humid that day, not too much unlike the Atlanta weather we had left behind. At the tail end of our day of walking and sweating in the oppressive heat, we had the pleasure of visiting the New York Botanical Garden in the Bronx. The garden itself is more like a park that spans 250 acres and follows a tram road and numerous trails. When you’re admitted there are two different tickets you can choose: one with access to the tram system and one where you don’t. Jeffrey and I opted to walk the gardens, which in retrospect was exhausting, but totally worth it. Sitting area near the entrance of the rose garden. When we arrived at the entrance of the rose garden, the day was still hot and humid, but blessedly cloudy. I was afraid that the roses would be wilting (much like myself), brown, and dead, but despite the heat and sore feet, the flowers and other plants were a pleasure to see. The roses were gorgeous and incredibly vibrant with colors ranging from deep reds and purples to corals and pinks. While I was expecting the different colors, I wasn’t expecting the smells. I’ve only ever smelled cut roses from the grocery store, and their scent is nothing compared to a garden of fresh, living roses. The different aromas weren’t at all overwhelming the way it might be when you walk into the Macy’s perfume section. Actually, the different smells were all complimentary and very light. I can only compare the experience to drinking aguas frescas. 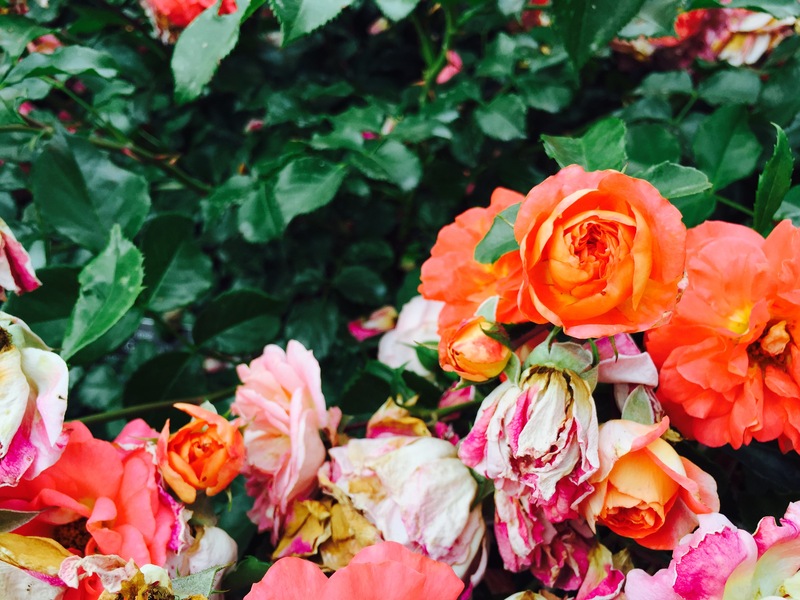 Looking at and smelling each flower was like taking sip of a different fruit infused water– with each sniff came a new “flavor.” Being in the rose garden was a feast for my nose and eyes. After walking in the sunny, concrete laden city, it was completely refreshing. The reflecting pond at the Native Plant Garden. We walked from the rose garden to the Nolen Greenhouses and through the Benenson Ornamental Conifers where I saw my first black squirrel. The ornamental conifers came from around the world and included a copse of red woods. We crossed the Bronx River, ambled through the azalea garden, and made our way through the Native Plant Garden. Nopales in the Rock Garden. bins and chipmunks hop around the foliage, it was very easy to forget I was in the middle of the Bronx and not in a well kept woodland. Next to the Native Plant Garden was the Rock Garden where I saw some of my favorite plants blooming and living in harmony with black eyed susans and long grasses: nopales. “The artist’s pyramid,” angle 1. Frida Kahlo: Art. Garden. Life. dedicated to Frida Kahlo and her Casa Azul. This exhibit is a recreation of Frida Kahlo and Diego Rivera’s garden in their Mexican home called Casa Azul, or “Blue House.” Upon seeing banners telling me that my destination was coming closer, I quickly got my second wind. “The artist’s pyramid,” angle 2. Frida Kahlo: Art. Garden. Life. certainly enchanted by the colors of the flowers, cacti, and succulents that lined the paths through the conservatory, which included bright yellow, red, and orange zinnias and marigolds as well as the deep greens and golds of agave and barrel cacti. Even though I can’t paint or draw to save my life, I felt compelled to try as I sat in a recreation of Kahlo’s desk and touched “her” paint. While I don’t believe there is a substitute for experiencing Kahlo’s actual Casa Azul, this “reimagining” of her studio was an amazing visual expression that connected Kahlo’s art, her relationship with Mexico, and her relationship with its native plants. I personally felt a connection to the colors and plants the curators chose. I felt moved when I saw flowers cohabiting with cacti and succulents. There are no other words to describe what I saw other than that it felt like home to be in a place where two types of plants with contrasting textures, shapes, and means of living are brought together. These are things Kahlo herself strove to present in her art: dichotomies living and clashing. Marigolds & euphorbia in the sunlight in the Haupt conservatory, Frida Kahlo: Art. Garden. Life. If you’re interested in seeing the exhibit itself you can buy your tickets here. The show will be at the garden until November 1st. If you’re interested in following the path Jeffrey and I walked in our evening in the garden, you can find it here on the New York Botanical garden’s map. Honestly, I was shocked when I retraced our foot steps and saw how far we walked. I promise there will be no way that you could be disappointed with the exhibit or with the gardens themselves. The entrance to the Daniel Stowe Botanical Garden. In July, Jeffrey and I were in Charlotte for a soccer game. On our way back to Atlanta, we stopped by the Daniel Stowe Botanical Garden. This garden “is the Carolinas’ garden for all seasons,” and it didn’t disappoint in its summer lush, brightly colored summer plants like sunflowers, echinacea, and hibiscus. The Daniel Stowe Botanical Garden is significantly smaller than the New York Botanical Garden, so it was much easier to walk. What contributes to its walkability is that it has many shaded pergolas and nooks and crannies tucked away in the various gardens, which makes hot days much more tolerable. Needless to say, we went on a particularly sunny, hot Carolina day and were happy to take advantage of the garden’s shade and water features. The West Pergola leading to the Orchid Conservatory. When we walked out of the Visitor Pavilion, we could see water features that stretch along the center of the differing sections of the garden from the beginning at the “Four Seasons Garden” to the end of the “Canal Garden.” The fountains follow you throughout your stroll, and they not only make for great eye candy, but they are also excellent for some ambient noise as this garden is so quiet that you hear the bees in the flowers. Because the day was so hot, we sought shade in the West Pergola where there were vine plants along the top and along the sides. It was like being in a leafed hallway the plant life was so dense. The shade was immensely welcome, and it was fascinating to see how many pollinators there were in this one section. I honestly don’t ever remember seeing more bees, wasps, butterflies, and lizards in one place. It was biologically diverse and it was an adventure finding different bugs and butterflies among the flowers. Orchids & the Waterfall in the Orchid Conservatory. We eventually made our way to the Orchid Conservatory where we were greeted by humidity, an arch of air plants, and orchids of all kinds. The day’s sunlight poured in through the glass surrounding us, and it was very much like being in a well lit rain forest. The only thing that was missing was the sounds of birds and frogs. I was particularly impressed by the water features throughout the conservatory. There were many orchid and fern laden waterfalls and still ponds surrounded by tillandsia and different bromeliads. One of the more interesting plants on the premises was a tall grapefruit tree that had large thorns growing out of its trunk. It had green fruit the size of my hand scattered all over its branches. I had never seen grapefruits growing before, so it was definitely a treat! I couldn’t help but imagine what it would be like to climb that tree with so many sharp spikes along the trunk and branches. Rainforest still life in the Orchid conservatory. I was impressed by how well presented everything in this conservatory was. There were places where orchids, rocks, moss, and large leafed tropical plants were so artfully arranged that it resembled a still life more than a representation of a wild rainforest. It was truly a work of art. Once we made our way out of the conservatory, we ambled through the Crepe Myrtle Grove. One of Jeffrey’s favorite trees in the South is the crepe myrtle, so walking through these trees dotted with white, pink, purple, and red flowers was particularly delightful. Especially when the occasional wind blew and we watched the petals dance to the ground. My second favorite feature of this garden was the Canal Garden. It had metal sculptures of fish “diving” in and out of the water and it was lined with tall grasses and pink flowers that would normally be found by the water. Even though there was little to no shade in this part of the garden, I was happy to hear the water flowing and to the see the pink, white, and red hibiscus along the pathway. We walked as far as the conifer garden before having to trudge back to the Visitor Pavilion for water and air conditioning. On the way back, we were rewarded for our travels in the Magnolia Allee. There is a water feature there that spouts water into the air over the pathway that turns off an on. When the feature turns on and off it lightly mists you as you walk beneath it. It was a blessed relief in the heat of the day. If you’re interested in checking out this garden, you can click here for pricing and hours of operation. If you’re interested in seeing the path we walked you can click here for the map of the garden. Last, but certainly not least, is the Atlanta Botanical Garden. Jeffrey and I are members of this garden, and one of the benefits that we have from being members, is not only visiting the Atlanta garden for “free” as frequently as we like, but we also get discounted or free admission to sister gardens across the country. We have gone here frequently this year to see the transition from spring blooms to summer flowers. The Atlanta Botanical Garden is larger than the Daniel Stowe Garden, but it is smaller than the New York garden. Needless to say there is still a lot to see in the different sections. When Jeffrey and I went this Spring, we were excited to see the many kinds of tulips, daffodils, and spring orchids that were blooming. 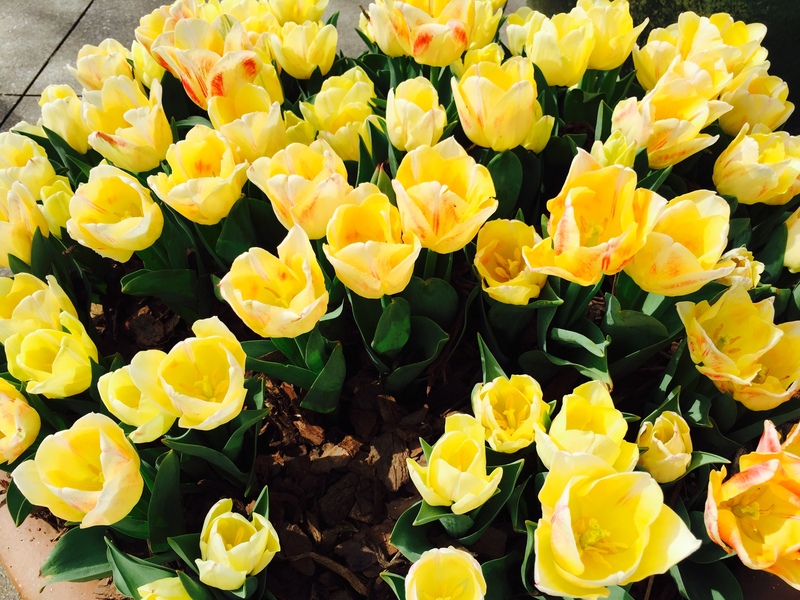 In March of this year, thousands of tulips were spread throughout the grounds and in containers along the pathways. Some of my most favorite tulips were kept in containers. These were of a dwarf variety, had very small ruffles along the edges of the petals, and were lightly lined in red. During a lecture at the garden, I learned that striped tulips get their stripes from a tulip virus. All tulips that have this striping have the virus. One important thing to note is that this virus doesn’t make the plant sick at all. It simply causes the variation in their coloring. This Spring the garden also did an exhibit in the orchid conservatory called “Orchid Daze: Pop!” that was inspired by Andy Warhol, Keith Haring, and Roy Lichtenstein’s paintings. 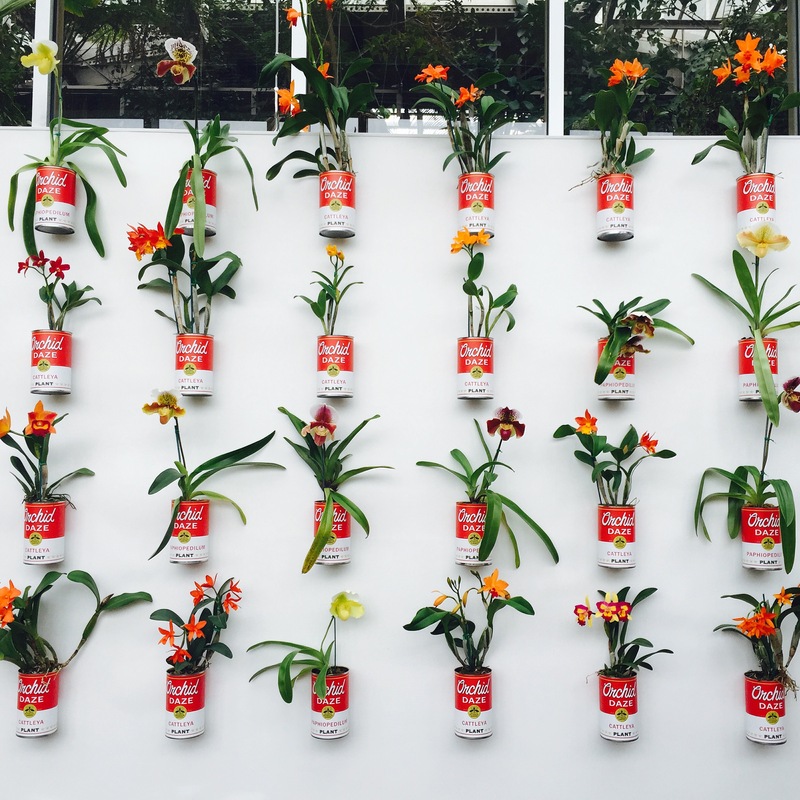 When you came through the door of the orchid conservatory, you were immediately greeted by orchids in soup cans that are meant to echo Warhol’s Campbell’s Soup Cans. While the orchids on display are always very vibrantly colored, the orchids in this exhibit were particularly striking shades of pink, orange, yellow, and red. One of the coolest things the garden did was allow people to purchase the orchids that were used in this exhibit starting at $10 a plant. I can’t say that I managed to buy one of these beauties, but I would have liked to! The Parterre Fountain Installation is always surrounded by beautiful landscaping all year long. In the Spring, it was surrounded by tulips of every color under the sun. This summer, tulips gave way to crepe myrtles, portulaca, and lilies. According to the garden’s website, this installation was created specially for the Atlanta Botanical Garden in 2004. The blue and white glass interprets “shapes and colors of water, ice, and sky,” which helps it easily transition throughout the seasons. There are so many delightful aspects of the Atlanta Botanical Garden, that it’s impossible to talk about them all in this post. In my most recent trip to the garden this month, 2 of the highlights were visiting the edible garden and the children’s garden. These are the 2 places that I always skip over in previous visits, and taking the time to journey through them made my experience all the more memorable. The edible garden was filled with tomato plants, peppers, okra, herbs, zinnias, and miniature pomegranates. There is a cooking station in this garden where they give Garden Chef Demos on Saturdays and Sundays at noon, 1 pm, and 2 pm. Unfortunately, I’ve never been to a class, but they use fresh seasonal food and food that is grown in the garden itself. The bull frog pond: Can you spot the 2 bull frogs? The children’s garden is a particularly magical experience despite the toys and obvious kid-friendly design. The garden houses a large water feature that kids can play in as well as multiple playgrounds. I like this area of the gardens because of the tall black eyes Susans, sunflowers, and shaded trees. I’m a petite woman and being in this garden made feeling small rewarding and fun with its oversized sculptures and interactive displays. One feature that is always entertaining to visit is the bull frog pond. The pond itself isn’t particularly amazing, but looking into it is always a surprise, especially when you glimpse a bull frog tadpole that’s the size of your thumb or even a full grown bull frog which is the size of a small dog. Looking for these frogs as well as the smaller frogs and fish is like a more exciting game of “Where’s Waldo.” It’s much the same for the rest of the garden because not matter how many times you go, you never know what more you’ll see the next time. 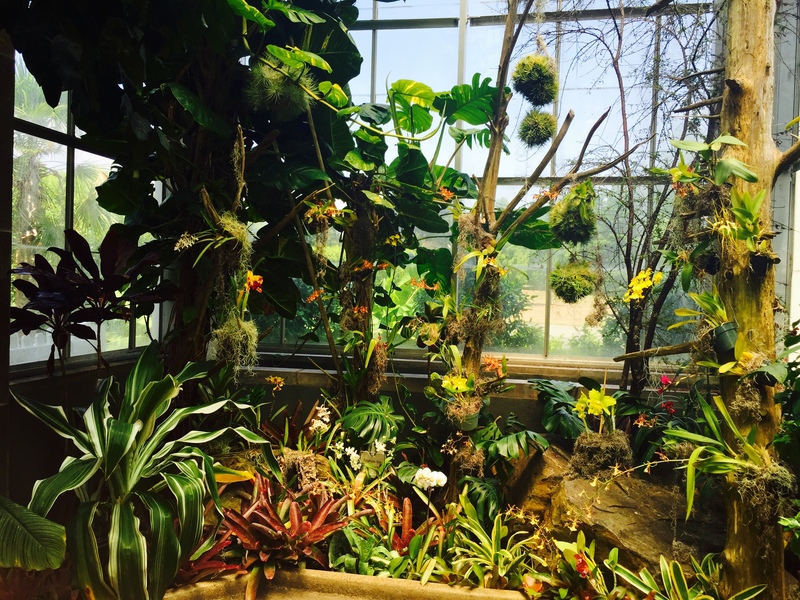 If you’re interested in visiting the Atlanta Botanical Garden, click here. If you’re interested in seeing how the garden is laid out, you can click here for a detailed map. Have you visited one of these gardens recently? Was there a favorite exhibit or section that I didn’t mention? I’d love to hear from you in the comments, so I know what to look for next time! Was there some part of my experience you would like to know more about? Leave a comment below or feel free to contact me. If you’d like to hear more about what The Garden Generalist is up to, please give me a follow on Instagram, Pinterest, and Tumblr! Be on the look out for my next posts in my continuing series on botanical gardens across the country and the world!